In true Avi form, in what his fans have come to expect, the stories are page turners. Each story keeps the reader glued to the book, curious to find out how the clever kids are going to come to terms with their experiences and carry on with their lives with a better understanding of who they are and what their family is all about. Avi uses simple language and short sentence structures to portray everyday events. At first this simplicity seems to belie the complexity of the emotional content of the stories, almost belittling the protagonists and reducing their conflicts to childhood mishaps. In “Dream Catchers” a young teenage Paul is angry about taking a trip to Denver for a week with his grandfather. Billy, from “The Kitchen Table” is upset about the small size of the kitchen table. And Marco from “The Amalfi Duo” wants to play drums instead of the recorder. None of these seem worthy of a drama in their own right. 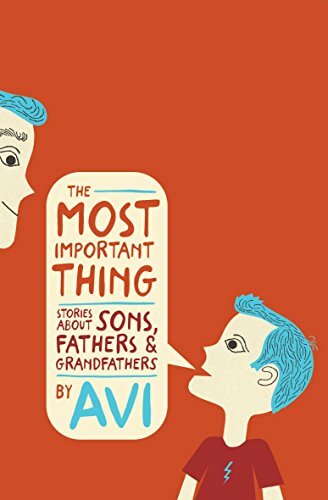 But this is where the seasoned brilliance of Avi’s storytelling shines so brightly, and we see that these opinions are the very factors of motivation for understanding and action. Avi is the master of taking something complex and abstract and breaking it into bite sized pieces. Another ingenious decision was in the title of the book, The Most Important Thing. It is very compelling. We all want to know what that most important thing is. But Avi never really answers. He leaves it hanging in the air as an after thought once each story is finished. In each story it is the kids who change their perspectives on the behavior of the adult men in their lives and not the other way around. Paul’s father will still be disengaged, Billy’s dad will still be absent, and Luke’s dad from “Departed” is always going to be, well, departed. But the kids have to continue to live with themselves; they need to decide what is important to them. While the book reads very quickly and is fiction appropriate for the middle-grade reader, there is so much content here that if a family is indeed experiencing a real-life, genuine fracture of relationship, loss, or emotional trauma, sharing this book is an excellent opportunity for dialog between adult and child to find out what would be the most important thing for mending, cementing, or embracing their own relationships.